Windscribe is headquartered in Canada and offers decent speeds. While their speeds aren't the best in the market, they can bypass the Netflix blocks using their US and UK servers, which is a remarkable quality. They allow P2P, so you can torrent your favorite TV shows and movies. With servers in almost 55 countries, they don't have the largest network but they offer many features that others don't. Apart from bypassing the Netflix blocks, they can also bypass the Great Firewall of China. Since China keeps updating their technology and filters more and more VPN providers, not many companies are able to bypass these restrictions. Windscribe is among the few VPNs that work in China. However, if you're planning to use it there, make sure you install Windscribe before you land in the country. The prices are pretty affordable and they have a special package that lets you build your own plan where you can add the locations of your choice. They accept several payment options including Bitcoin. They also offer static IPs and team accounts. With the ability to run on all major platforms, you can use Windscribe on all your devices. And since they have high-grade encryption, their VPN will protect you from hackers and spies. While they don't have live chat support, they do have a chatbot named Garry that will provide answers to some common questions. There's no real person there, but it's better than having no live chat support at all. Windscribe offers setup guides, a knowledge base, and an FAQ section. But if you don't get the answers you were looking for, you can visit their subreddit or talk to their chatbot, Garry. Garry is a little bot that's available on the live chat section. While it's not a real person, it's next to the best thing. And if you're still stuck, you can open a ticket and they'll reply in a day. Live chat is often the best way of support since it provides quick answers. While Windscribe doesn't have it, they do provide a creative alternative for that. Windscribe offers free and paid options. If you go for a free plan, you get to access servers in 10 countries and can use 10GB/month. However, the speeds on the free plan are really slow. For better speeds, you can use the paid version. Windscribe is pretty affordable. While the prices are not very low, they are average. They offer two main plans for individual users — monthly and yearly. There's also a third plan, which lets you add the locations of your choice to your plan. Each location will cost $1 per month. So if you're looking for just one location, you can get the VPN at $1/month, which is super economical. Windscribe offers a 3-day money back guarantee. However, to get your money back, you shouldn't have consumed more than 10GB. A 3-day money back guarantee isn't much, considering that several others are offering 30-day guarantees. But then, they offer a free account and you can try that before you make a purchase. Apart from individual accounts, they have static IPs and team accounts as well. If you're a business looking for a unique IP address, you can request them for a static IP. Special team accounts are available for enterprises. These accounts will let you manage your team more easily. Windscribe has apps for Windows Mac, Android, and iPhone. It can be configured on several other platforms as well. For example, you can configure it on Linux, Windows mobile, Amazon Fire TV, Kodi, routers, and others. You can download the desktop apps from their website. The smartphone apps are available on their respective app stores and the configuration settings are available on the website. Installation takes a couple of minutes and configuration can take about 10-12 minutes, depending on your level of technical proficiency. Once the VPN has been set up, you don't need to configure it each time. All you need to do is connect to it and enjoy a safe and secure online experience. The apps are really easy to use and you'll be able to bypass the geo-restrictions of Netflix on the UK and US servers. And that's not all — Windscribe will help you access the free internet when you're in China. However, there's one downside to their services — the speeds are not exactly blazing fast. If that's one thing you can live with, Windscribe can be a good choice for you. Windscribe is based in Canada, which is among the Five Eye countries. However, they promise that they don't store user data, which makes it safe to use. They don't store your IP or the IP of the server you're connected to. They don't store the web pages visited by you either. However, they do keep a track of the bandwidth consumed by you each month. They say they do it to pose bandwidth restrictions on free accounts. They also store timestamps. While many people think storing timestamps is harmless, I think timestamps can give away some details about your connections, and it's always best to select a VPN that keeps no user logs at all. 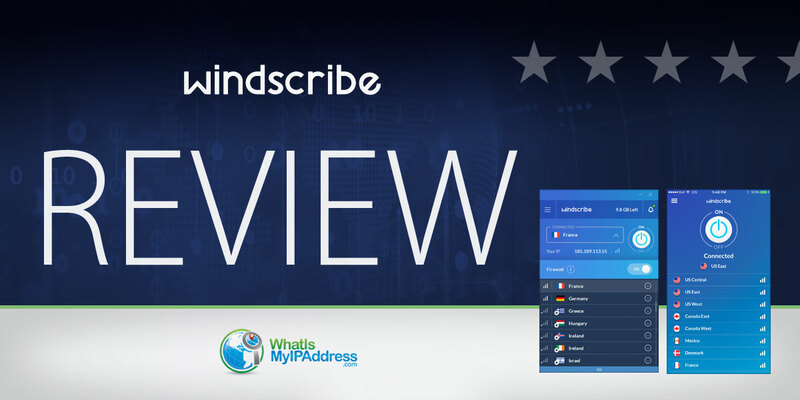 If you're looking for a free VPN, Windscribe is a good option. But the free plan doesn't offer decent speeds. While the speeds on their paid plans aren't blazing fast either, they're still better than the ones offered by the free plan. They have a network of servers in 55 countries and you can access them all on the paid plan. And if you want to access just one location, you can get their Build a Plan package that will charge you just $1 for a location. Windscribe has apps for all major platforms and it can also be configured on other devices such as routers and Amazon Fire TV. Their apps are pretty easy to use and you'll be able to connect to the VPN in just a few seconds. If you're a Netflix lover, you'd be happy with Windcribe services as they are able to unblock Netflix on their US and UK servers. This means you can watch a number of US and UK TV shows without any issues. Also, Windscribe is able to bypass the Great Firewall of China. You can just install Windscribe before you land in Beijing. This way, you can access all your social media profiles without any issues, even while you're in China. And if you're not a Netflix lover, you can use Windscribe for torrenting as P2P is allowed on its servers. Coming to its security standards, Windscribe offers OpenVPN and AES-256 bit encryption, which is practically unhackable. Windscribe doesn't offer a live chat feature, which is a drawback. However, they have a chatbot that can assist you with some common questions. And if you want to talk to real people, you can open a ticket and they'll reply within 24 hours. They offer decent privacy with partial logs as they keep the records of users' timestamps. However, they don't track your IP or the web pages you open. Overall, it's a decent VPN and suited mainly for people who want to watch Netflix or for those are traveling to China.